One of the special properties of water is its resistance to phase changes. It requires 334 J to melt 1 g of ice at 0°C, an enormous amount of energy. Of common substances, only ammonia has a higher specific enthalpy (latent heat) of fusion. Direct conversion of ice from the solid to vapor phase is an even greater energy sink; sublimation of ice at 0°C requires 2834 J g-1. Energy that is consumed for evaporation or sublimation is unavailable for melting snow and ice, a process that limits ablation in arid environments (e.g., high elevations in the tropical mountains and on the East Antarctic plateau). The high specific enthalpies of phase change in water are a result of its small molecular size and strong hydrogen bonds, which reduce the intermolecular distance. A water molecule also forges hydrogen bonds with four adjacent water molecules, which distinguishes it from other compounds that have hydrogen bonds (e.g., methanol). The strong intermolecular bonds and stable tetrahedral structure make it difficult to separate water molecules. This also gives water unusually high freezing and boiling point temperatures. where T is the ice temperature in degrees Celsius. This gives ci = 1.955 J g-1 °C-1 at -20°C. The value for snow is similar, although the volumetric heat capacity, (rc)s, is much smaller due to the low density of snow. Cold snowpacks delay the start of the melt season, as snow must first warm to 0°C before melting can occur. This process is known as snowpack "ripening," or the development of an isothermal snowpack. In most situations, the energy involved is relatively minor compared with the latent energy that is needed to melt seasonal snow. Consider a 1-m-deep snowpack with a mean temperature of -10°C, a density of 300 kg m-3, and a heat capacity of 2.09 J g-1 °C-1. With a net energy flux of 200 W m-2, it requires 8.7 hours to warm the layer of snow to the melting point. This same amount of energy would melt 0.018 m water equivalent (w.e. ), a small fraction of the energy needed to melt away the snow. Midlatitude glaciers experience several meters of water-equivalent melt per year, so the early-season warming of the winter snowpack is a minor component of the energy budget. This is not true at the highest latitudes and altitudes (e.g., the interior of Greenland and Antarctica), where energy is limited and the thermal inertia of cold snowpacks helps to inhibit meltwater formation and runoff. where m = 0.054°C ppt-1 is the freezing point depression of water as a function of salinity, S is the salinity in parts per thousand, and Lf is the latent heat of fusion of pure water. This equation avoids a singularity as T " 0°C because all of the sea ice has melted away by that point, assuming S > 0. When S = 0, csi = ci. For T = -10°C and S = 10 ppt, csi = 2.037 J g-1 °C-1. As temperatures warm, more energy is committed to the phase change (latent heat), and the effective heat capacity increases (e.g., csi = 2.144 J g-1 °C-1 when T = -2°C and S = 10 ppt). The concept of effective heat capacity, combining the energy required to warm the ice and that associated with the enthalpy of melting (in this example), is practical for modeling any system where the phase change does not occur abruptly at 0°C. Freezing of clay-rich soils is similar; surface tension effects from fine particles result in free water at temperatures well below 0°C, so effective heat capacity can also be used in modeling freezing front propagation in soils. where T is the absolute temperature and a is the specific volume (inverse of density). Da is the change in specific volume associated with the phase change from water to ice. At 0°C, Eq. (2.3) gives 9T/9P = 0.074°C MPa1. As an example, overburden pressure shifts the freezing point of pure ice to -1.8°C under 1 km of sediments with an average density of 2500 kg m-3. This effect decreases slightly at lower temperatures. Pressure-melting effects are greater in glacier ice, where ice typically has air, water, and impurities in interstitial and intergranular pore spaces. In water that is saturated with air, 9T/9P = 0.098°C MPa-1. Because glacier ice contains dissolved air bubbles, this provides a better estimate for the freezing-point depression in glaciers. This translates to 8.8 x 10-4 °C m-1 for an ice density of 917 kg m-3, which gives pressure melting points of -0.18°C and -3.53°C under 200 m and 4 km of ice. This freezing-point depression has subtle but important effects on meltwater at the base of a glacier or ice sheet or for glacial ice in contact with the ocean. Melt-water that drains from an area of thick ice to thin ice in a glacier will be supercooled, and it can freeze on at the base of the thinner ice. Similarly, ice at the base of a floating ice shelf may or may not be colder than the ambient seawater, depending on the ice-shelf thickness. Combined with complex subshelf ocean circulation patterns, this gives regions of ice shelves that are subject to high rates of basal melting while other ice-shelf areas experience basal accretion (freeze-on). Thermal conductivity is perhaps the most interesting and important thermodynamic parameter for snow and ice. As a result of its abundant air space, snow is an excellent natural insulator. It takes only a few decimeters of snow cover to insulate underlying ground or ice from atmospheric temperatures. This plays a critical role in the growth and thickness of permafrost, freshwater ice, and sea ice. A deep snow cover limits underlying ice thickness. with temperature once again in degrees Celsius. where snow density has units of grams per cubic centimeter. This gives a range from 0.03 to 0.70 W m-1 °C-1 for densities typical of seasonal snow. Fresh, dry snow has much lower values (table 2.1), whereas rounded grains, dense wind slab, and liquid water content promote dense snow and thermal conductivities that are similar to that of water. 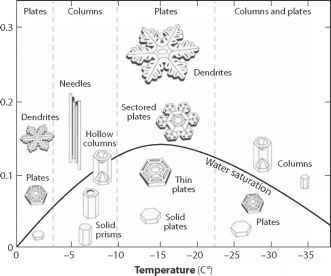 As snow transforms from firn to ice, thermal conductivity continues to increase to a value that resembles that of other solids, such as mineral soils and rocks. where S and T are the salinity and temperature of the ice, in ppt (%o) and degrees Celsius, pi is the density of pure ice, and psi is the density of the sea ice. The density ratio is introduced to capture the influence of air-filled pore space, which reduces the thermal conductivity relative to pure ice. Literature values of b are in the range 0.09-0.12 W m-1 ppt-1. For a case with T = -2°C and S =10 ppt, b = 0.09 W m-1 ppt-1 gives ksi = 1.68pjp, W m-1 °C-1. At -10°C and S = 10 ppt, this increases to ksi = 2.13 pjpi W m-1 °C-1. Thermal conductivity is a primary parameter for heat transfer, but thermal diffusion also depends on the density and specific heat capacity of the material. The thermal diffusivity, k = k/(pcp), determines the depth and rate of penetration of atmospheric temperature signals into snow and ice. Typical values are given in table 2.1. Daily temperature signals (diurnal warming and cooling) penetrate to tens of centimeters in seasonal snowpacks. Diffusion of the annual temperature cycle in glaciers, ice sheets, and permafrost reaches a depth of approximately 10 m.
and vapor moving through the snowpack can be deposited. Both of these mass-transfer processes release latent heat, warming the snowpack. This is an important part of the ripening process in glacial environments: It can give mean annual surface temperatures several degrees Celsius warmer than the mean annual air temperature.